Explanation: The dark-floored, 95 kilometre wide crater Plato and sunlit peaks of the lunar Alps (Montes Alpes) are highlighted in this sharp digital snapshot of the Moon's surface. While the Alps of planet Earth were uplifted over millions of years as continental plates slowly collided, the lunar Alps were likely formed by a sudden collision that created the giant impact basin known as the Mare Imbrium or Sea of Rains. The mare's generally smooth, lava-flooded floor is seen below the boardering mountain range. The prominent straight feature cutting through the mountains is the lunar Alpine Valley (Vallis Alpes). 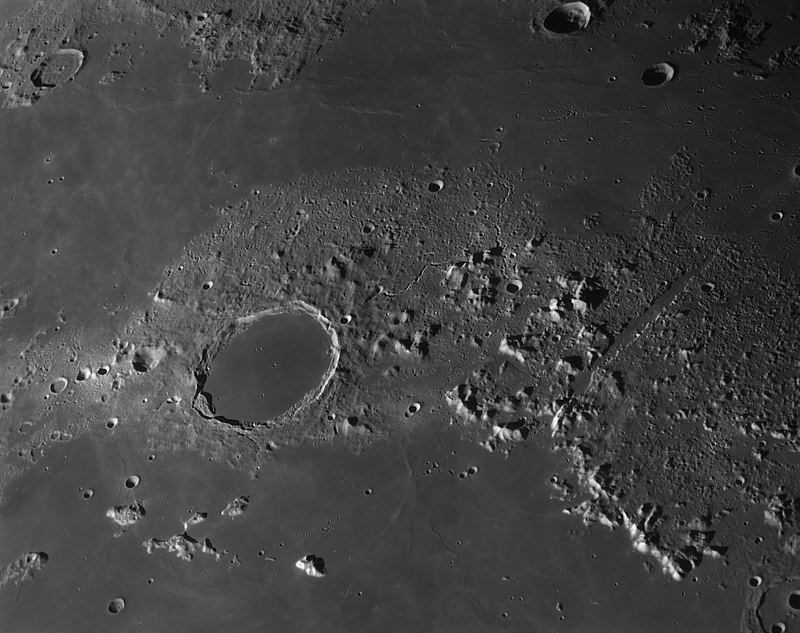 Joining the Mare Imbrium and northern Mare Frigoris (Sea of Cold) the valley extends toward the upper right, about 160 kilometres long and up to 10 kilometres wide. Of course, the large, bright alpine mountain below and right of the valley is named Mont Blanc. The tallest of the lunar Alps, it reaches over 3 kilometres above the surface. Lacking an atmosphere, not to mention snow, the lunar Alps are probably not an ideal location for a winter vacation. Still, a 150 pound skier would weigh a mere 25 pounds on the Moon.